Protective Custody • Run Hard. Rest Well. That’s quite a prediction for a young teen who was up round-the-clock satisfying the hunger pains of the Son of God packaged as her new born babe. I imagine her double-take. Searching the aging eyes of the man before her, she grips the baby in her arms as the words slowly penetrate her heart. Did she tremble? At that time Mary was in unfamiliar territory wading through a load of loss – the loss of her reputation, her family, her home…the loss of everything safe and normal and known. Standing before her and her new husband, Joseph, was a task too daunting for anyone to fully comprehend. How often did the angel’s words flood her soul, fighting back the fear that threatened to consume? Nothing is impossible with God. Nothing is impossible with God. 2015 makes me tremble, if I am not careful. This is where the Christmas story comes to life. Here, as we tip toe into a New Year, the Prince of Peace (Isaiah 9:6) invites us to allow Him to place our hearts in protective custody. Paul, in his letter to the persecuted Body of Christ in Philippi, reminds them that …the peace of God will guard your hearts and your minds in Christ Jesus. Protective custody. Guarded by the One and Only. The blows and burdens of 2015 are not a matter of if, but when. David, having been seized by the Philistines in Gath forms a simple prayer that can become ours. When I am afraid, I will trust in you. I spent most of 2014 wearing a yellow TRUST t-shirt. I needed that daily declaration. My crew, having grown tired of yellow, made sure I have a slew of colors to pick from this coming year, but the declaration remains the same: Trust. It is possible because God will not give me anything He can’t handle. We are safe. Jesus came to make it so. Find your Bible. Dim the lights. Light a candle. 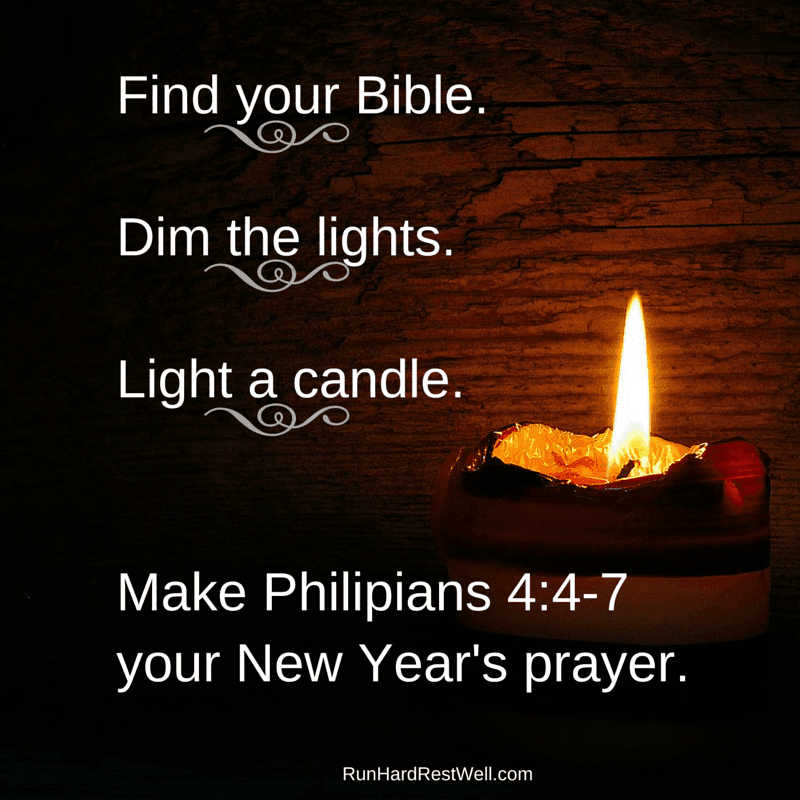 Make Philippians 4:4-7 your New Year’s prayer. What allows you to enter 2015 with confidence and great expectation? Great reminder. I love this post. In a bible study recently we were talking about faith…go figure…and it came up that God does not call us to believe and trust in Him without giving us everything necessary to do so. So, what is there to fear? Life is not always easy…..ever easy? We seem to struggle with the day to day. When I am able to Trust in the Lord with the current situation that is attacking my peace, I let it go, knowing God has it covered. He is the Author and Finisher of my faith. He is the Creator. His ways are Right, Perfect, Life Changing. Why hold to the struggles when I can do nothing, and He can do everything, and He does do everything Well. Jesus does everything well…with love and truth. Lord, guard my heart. The past few days I have lots of time to reflect. I look back again (it seems I do this every year) and I can see when God was holding me. He was/is holding me right now. He hasn’t given me any more or less than what I can handle. He has showed me how to do some tough loving and how to “Let Go”. Letting go is some of the hardest, and at times, most holy work we can do. It often makes us tremble. May you be held tight in the grip of grace. Reading his blog slows my breathing and calms me. Love the idea of being in protective custody. Our church is preparing for a January month of Sabbath. We haven’t done this before. This blog is serving as one of many resources. Thank you. Your encouraging words bless me. Thank you. If time allows, tell me more. I would love to hear how your church is preparing for a month of Sabbath. This month, we are hoping to offer a free personal retreat guide. It invites God’s people to a few quiet hours of Sabbath Celebration at the feet of Jesus. If we don’t get it out in a week or two, contact me. I will try to send one your way. Blessings!